Case study location: Alma Mater Society Roots on the Roof, rooftop garden on the top of the new Student Union Building (The Nest) at UBC Vancouver. Potential case study topics: Visual Art, Education, Social Science, Environmental Science, Biology, Urban and Environmental Design, Civil and Environmental Engineering. 2. Watch the Roots on the Roof video above. 3. Read through one or more of the Pathways below. 4. Visit Roots on the Roof garden. 5. Return to the pathways, read the material, and answer the questions. In 1915, the UBC Vancouver campus was established. The Faculty of Agriculture was amongst its founding units. The original campus plan proposed approximately 200 acres (a large proportion of the campus area at the time) designated to farmland for agronomy, horticulture, and animal husbandry. Why grow food on campus? This case study provides an opportunity to explore this question through a number disciplinary lenses. Through an examination of the role of food production spaces at UBC, we learn to identify and understand the multi-functionality of urban agriculture. Each of the four pathways considers the opportunities and limitations of urban agriculture for food production, community engagement, ecological resilience, and sustainable urban development. The geographic centre of this case study is the rooftop garden at the Student Union Building (The Nest) at UBC, run by Roots on the Roof, a student-led Alma Matter Society (AMS) club. Components of this case study can be utilized when visiting rooftop gardens and community gardens around North America. Urban agriculture is a broad term denoting the subsistence and/or commercial production of fruits, vegetables, mushrooms, herbs, livestock, meat, eggs, milk, honey, and other raw agricultural products within towns and cities, grown for personal consumption, sale, donation, or educational uses (McClintock et al. 2012). Urban agriculture can also be seen as a tool to promote all pillars of sustainability: economic, societal, and environmental. For example, while many residents benefit from the food production capacity of community gardens, these space can also be powerful community food asset and gathering place that can promote and enhance sustainability, neighbourhood livability, community ownership, innovative design, and biodiversity and ecosystem services (City of Vancouver 2017). A fundamental planning concept, engendered by Jane Jacobs, states that successful community spaces must exist and perform beyond their primary use (City of Vancouver 2017). On UBC-Vancouver’s campus, a range of urban agriculture activities exist, such as the 24-hectare UBC Farm in South campus, academic gardens for outdoor teaching and collaboration, community gardens affiliated with the University Neighbourhood Association, and the use of edible and medicinal plants in general landscaping designs. In 2010, the AMS challenged students to propose a design for the inclusion of a rooftop garden in the new Student Union Building. A group of students from the Faculty of Land and Food Systems crafted the original proposal, which highlighted the rooftop garden’s potential to enrich students’ learning experiences and promote sustainability awareness. Roots on the Roof (ROTR), a club of dedicated students, was created to manage the space. ROTR now operates a Community Supported Agriculture (CSA) program, a rooftop garden, community garden plots, and a variety of community engagement events around food, culture, health, and sustainability. Broadly defined, urban agriculture denotes the subsistence and/or commercial production of fruits, vegetables, mushrooms, herbs, livestock, meat, eggs, milk, honey, and other raw agricultural products within towns and cities, grown for personal consumption, sale, donation, or educational uses (McClintock et al. 2012). Urban farming activities can be defined as when “fresh food is grown primarily for sale, or the food produced is primarily consumed by someone other than the growers” (City of Vancouver 2017). a place on City-owned land, other than City parks, operated or overseen by a non-profit society, where people grow and maintain ornamental and edible plants (City of Vancouver, n.d. Operational Guidelines for Community Gardens on City Land Other Than City Parks). ornamental and edible plant production spaces within school grounds designed for opportunities for learning, for increasing access to healthy food, for promoting enhanced social and emotional development, and for contributing to the greening of school grounds and the building of green spaces for surrounding neighborhoods (Vancouver Board of Education 2010). Defined as the development of agricultural activities on the top of buildings by taking advantage of the available spaces on roofs or terraces, which can be developed through open-air and protected technologies and used for multiple purposes (Sanyé-Mengual et al 2017). Edible landscapes are food-producing landscapes integrated within existing landscape design and programs, including integration with non-edible plants and non-food related programs; enclosed and unenclosed examples exist (Napawan 2016). There are strong social and collective dimensions of gardening that help leverage urban food production spaces as vital community assets. If well-planned to be inclusive cultural spaces, community gardens can serve as a venue and vehicle for interactions between diverse users and stakeholders and can build connections across social and cultural divides. If well-operated as democratic spaces, community gardens serve as a vehicle to engage individuals and communities in efforts toward other social and environmental initiatives. Aptekar (2015) even suggests that conditions of diversity in community gardens can help create spaces of resistance to larger power structure. However, while community gardens typically boast a low barrier-to-entry with regards to the cost of a membership or garden plot, Aptekar (2015) suggests that social hierarchies and exclusivity in urban gardens do arise. For example, in its research on New York City community gardens, Aptekar found that community members did draw on their privilege and resources to leverage support from institutional actors. This is just one of many examples of the type of challenges community gardens face. Community gardens are also potential sites of confrontation between city-backed developers and local residents ﬁghting to preserve these spaces in the face of gentrification (Aptekar 2015) Inclusive, democratic or resilient community gardens can be challenged by a heterogeneous urban context where there is a complex web of intersecting categories of race, ethnicity, and language. In Vancouver, there have been cases of conflict and angst between gardeners and neighbours (e.g., Vancouver Sun 2013). In response to the challenges between the gardeners and developers, the City of Vancouver had laid out guiding policies and principles to help mitigate these tensions. ). How might they improve their practices to promote inclusion? when they argue that inclusion and exclusion can and should exist simultaneously? ), the largest obstacle to community engagement is that people feel like they do not have much to offer (27% of respondents). Does a platform like ROTR (offers drop-in volunteering, workshops) accessible to those who struggle to be engaged in their community? Why or why not? City of Vancouver. 2015. Park Board Urban Agriculture Policy. City of Vancouver, n.d. Inclusive Community Gardens: Planning for Inclusive and Welcoming Spaces in Vancouver. UBC and the City of Vancouver collaborated on this guiding document for improving access to community gardens. Accessibility, availability, adequacy, acceptability and agency are noted as the five goals of inclusionary design. Neo, H., and Chua, C.Y. 2016. Beyond Inclusion and Exclusion: Community Gardens as Spaces of Responsibility. Annals of the American Association of Geographers 107:3. The authors examine how municipal policy related to urban farming in Vancouver supports or impedes greater food system sustainability goals. Through the comparison of four urban farms, the authors highlight issues in food literacy and inclusion at the municipal policy level as well as the multifunctional role urban farming can play in feeding the city and expanding urban consciousness to peri-urban and rural issues. Community-based art has been regarded as a powerful vehicle for social change (Creative City 2005). Art and culture can drive creativity and imagination, break down barriers, connect across cultural differences, and engage our shared values. The Neighbourhood Arts Network in Toronto describes the practice of community arts as “a unique and effective approach to community building that fosters relationships between artists and residents, while producing exciting, unique art, and nurturing mentoring opportunities”. The International Centre of Art for Social Change in Vancouver adds “art is central in helping people to find new ways to see the world and in developing models that integrate and celebrate imaginative thinking, leading to mobilization and effective action”. Roots on the Roof uses their rooftop space beyond its primary use as a garden and hosts community-based art events and installations. ROTR notes that “a qualm we have with certain “local”, “sustainable”, and “organic” food movements is that they often cater to certain types of communities, and those who cannot participate in these food movements due to income or systemic barriers are not acknowledged as having valued experiences/knowledge for how they view their own food system” (ROTR Blog 2015). Rooftime Stories, a community-art installation conducted at Roots on the Roof in 2015, explored how different people with different identities connect with and through food. Storytelling has two major points of appeal according the American Planning Association. First, it appeals to the participants because it enables them to share in their own voices. Second, it has benefits for planners because it results in personal feedback and can be conducted with minimal materials. Through the Rooftime Stories project, organizers at Roots on the Roofs were made aware of the needs and interests of their community. These lessons can drive future community engagement projects. Lantern, wreath, and other art workshops are also organized at Roots on the Roof as a part of their on-going efforts to engage with the community. While these workshops focus on the use of natural materials, community-based art projects vary from environmental art projects. The City of Vancouver has welcomed environmental art projects throughout public spaces in the city that range in size and scale. While both disciplines often focus on projects created with natural materials, collaborative processes drive community-based art. These collaborative processes strive to be inclusive and barrier-free to welcome diverse community members. In an interview with Young Agrarians, a network of new, young , ecological and organic farmers, Lucas Chan, president of Roots on the Roof (2016/2017), reflects that one of group’s biggest challenge is “finding ways to continue to engage our community beyond just normal garden drop-ins or attending events”. Community-based arts can contribute to the growth of their community and allow personal expression. 1. Rooftime Stories is complete – or it appears to be completed. What are some examples of community-art projects or installations that are evolving? What are the benefits of an evolving or growing art project? 2. For you, is the community-art installation a single entity or a collection of separate art pieces? Try and see it the opposite way from your initial reaction. Does the message of the art piece change? Skippington, P. A., and Davis, D. F. 2016. Arts-based community development: rural remote realities and challenges. Rural Society 25(3). Kistler, N. 2013. AgriCULTURE: A Plan for Cultivating Arts and Culture in Seattle’s Urban Agriculture Sites. City of Seattle. This plan highlights eight Guiding Principles which establish the role that the arts play related to urban agriculture. Project activities, precedents, strategies and examples can benchmark ROTR against other projects. Cornell University College of Agriculture and Life Sciences, n.d. Dig Art! Cultivating Creativity in the Garden. A project guide for educators that integrates gardening and the arts. Activities for various ages groups are provided. Agriculture initiatives can be located in diverse urban settings including residential yards, alley ways, temporary spaces zoned for future development, and city park land. They can also be located on top of buildings as green roofs, as in the case of the UBC Roots on the Roof community garden. Green roofs create novel ecosystems that are increasingly common in cities. They range in shape and scale, from a park on a privately-owned building to a small installation on a single-family home. In some municipalities, incentive programs promoting green infrastructure have resulted in thousands of square meters of green roof installed per year (e.g. Toronto, Canada; Basel, Switzerland). Green roofs are installed on new buildings or retrofitted to existing ones for environmental, social or economic purposes (GSA 2011) and are actively promoted by climate change adaptation and storm water abatement policies (Carter and Fowler 2008). An exploration of the benefits of green roofs in New York City. Green roofs have greater organism abundance and species diversity than conventional roofs. Green roofs can support species diversity, composition and abundances of organisms comparable to ground-level habitats. Green roofs designed specifically to support native organisms support greater species diversity and abundance of organisms than standard, green roofs. Green roofs can aid rare species conservation. Green roofs can replicate ground-level ecological communities. Green roofs can facilitate movement of organisms through urban landscapes. The Roots on the Roof community garden is an example of a green roof, which was built with engineering benefits in mind (storm water retention, energy consumption). Yet, through its food production, the green roof may also procure habitat for a diversity of urban pollinators. 1. After reading the Global Roundtable from the Nature of Cities website, what components of ROTR and the rooftop garden as desirable for species? Pollinators? 2. How might ROTR encourage more pollinator species in their space? Or on other satellite spots on campus? 3. From your perspective, how can story of urban pollinators be better told to propel the conversation about urban pollinator conservation and their critical services? On a small scale (on campus)? Large scale (federal policy)? The Nature of Cities, n.d. Global Roundtable: Can cities save bees? How can urban habitats be made to serve pollinator conservation? How can that story be better told? A group of scientists and researchers weigh in on the potential of pollinator conservation in urban areas. There is no consensus on this issue at present time, but the authors insist on further research to better assess the potential of urban pollinator conservation. City of Toronto. 2015. Green Roof Bylaw. Stapelton et al. 2017. Pollinator Homes on UBC Campus. UBC Sustainability. A student SEEDS project that offers various prototypes for “pollinator houses” to increase bee habitat in urban areas. These prototypes are often small-scale and could be housed on a rooftop garden. Riley et al. 2009. 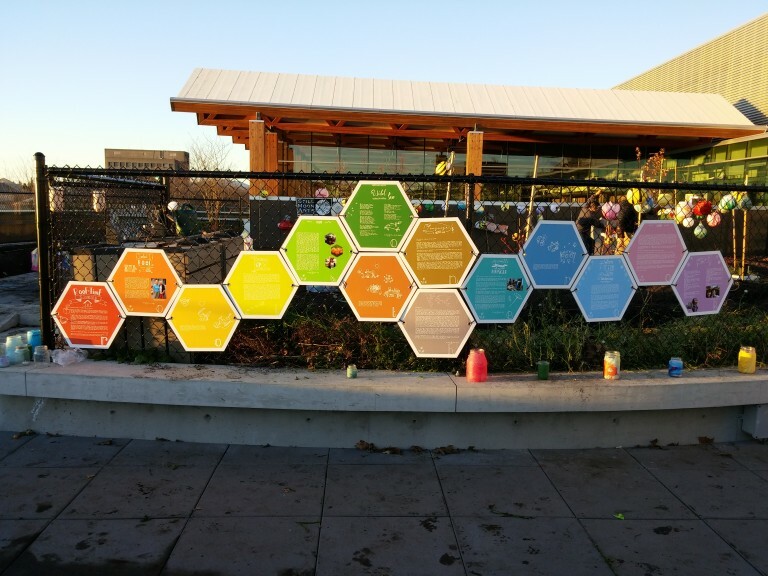 UBC Food System Project: The Importance of Bees for Global and Local Food Security. UBC Sustainability. A student SEEDS project that investigates how bees as pollinators in the farm landscape can help the UBC Farm achieve its goals of proving climate-friendly food. The authors include strategies to increase native bee populations at the UBC Farm. A University of Bristol video highlighting the ecological benefits of green roofs, specifically with regards to pollinator health. Best design practices in urban agriculture typically look at design in terms of the most efficient use of light, heat, soil quality, and water access. Plot design incorporates physical accessibility for seniors and those with accessibility constraints; wide, well graded paths between plots is standard in community gardens. In a study of the landscape elements (paths, plots, benches, fruit trees, children’s play area, gather spaces etc.) within community gardens, paths occupied on average 39% of the spatial allocation, while the community plots occupied just 27% of the space (Bradley et al. 2014). For the most part, community garden plots in Vancouver have become prescriptive in design: occasionally raised, rectangular plots, arranged in rows. Although well designed for physical accessibility, this type of design is conducive to an allotment style of gardening, where the primary purpose is personal crop cultivation (City of Vancouver 2017). Personal use is only one aspect of community gardening in Vancouver and communal plots, where gardeners plan and grow crops together, are becoming more common. At Roofs on the Roof, a large communal garden plot is the centrepiece of the garden. In addition, ROTR manages five community garden plots on the roof of the SUB beyond their main fenced garden. Each year, club members who sign up for the external community garden plots are grouped with other community gardeners and get direct hands-on experience and support with planning, growing, and harvesting their own plants and produce over the course of the growing season (ROTR 2017). These smaller communal plots offer a space for longer term experiences and knowledge sharing. 1. Is the rooftop garden at The Nest designed to be accessible for the UBC community at whole? What type of features are utilized to make it welcoming and accessible? 2. Which features of the rooftop garden at The Nest act as a barrier? Do you think they were done intentionally? Delgado, C. 2013. Contest urbanism: Meaning and manifestation in community garden design: A case study of the Black Rock Heritage Garden, Buffalo, NY. State University of New York in Buffalo, ProQuest Dissertations. Delgado explores how the morphology of urban places is a result of larger socio-economic and political forces. She offers that the competing interests of citizens and public officials is reflected in physical design of community gardens. Massachusetts Institute of Technology. 2006. MIT Open Course Ware - Design for Sustainability. This open education resource is of course content from the Design for Sustainability course at MIT in 2006. The course used life cycle assessment (LCA) and Leadership in Energy and Environmental Design (LEED) methodologies to explore sustainable building design. Bradley, L. K., et al. 2014. Design Matters in Community Gardens. Journal of Extension 52(1). The authors analyze landscape elements of 10 professionally designed community gardens, and make recommendations to help professionals work with garden designers and volunteers.